Microsoft has dominated the tech landscape for more than 40 years, but has only ever had three CEOs. Stephen Hall went to Lords cricket ground in London to meet its latest figurehead, Hyderabad-born Satya Nadella, who puts empathy at the centre of his vision for the Silicon Valley giant. There is comfort to be drawn from the simplicity of cricket. At the UK’s cathedral for the game, Lords, Microsoft CEO Satya Nadella cuts a relaxed figure as, dressed in regulation whites, he bowls a few balls in the autumn sunshine. The 50-year-old is Microsoft’s first chief executive born outside the US, and joined the company in 1992 from SunMicrosystems. His appointment as CEO in 2014 surprised many, but his two years in charge have galvanised Microsoft. The company’s stock has risen 60% since Nadella took over, and the fact that he has redirected the business strategy from a stalling smartphone foray towards a flourishing cloud enterprise is equally impressive. It’s been over three decades since Bill Gates’ ‘computer on every desk, in every home,’ call to arms led to the software giant’s all-out assault on the marketplace. Nadella has redefined the company’s mission statement, and technology has pervaded every area of daily life. 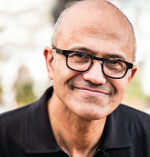 Despite the modern condition of near-permanent connectedness, Nadella believes the importance of empathy has increased. Upon his arrival, the tech leader began to apply his brand of humanism, fashioned by his experiences, into the corporate environment. He has argued for Microsoft to fight to rediscover its soul and has assimilated techniques, such as mindfulness, into his leadership teams while working to break down barriers between the company and its customers. The company has historically met those needs by putting computers in offices and providing the everyday software that enables modern businesses to function. Microsoft has now designed new software that could change the working environment all over again. The HoloLens, a holographic augmented reality (AR) headset, blends the physical and virtual worlds, enabling engineers to build complex models in minutes. There is potential for this equipment within the office as well; instead of sitting at a desk, one could work while standing up, or walking around without a keyboard. The Surface computer is another flagship Microsoft product making waves in global markets. Nadella explains that Microsoft customers expect the company to get in touch with their real needs, through these products, and this, he believes, requires a deep sense of empathy. This core value system has been sculpted by his journey from his origins in the city of Hyderabad in India to his arrival in the US at the age of 21. It has since been influenced by his son, Zain, who was born with cerebral palsy. “When I think back to these moments, that, perhaps, more than anything else, reshaped who I am and what I am today. I was 29 years old, my wife Arnu and I were the only children of our respective parents and were really excited on the birth of our son, even an hour or two before he was born,” Nadella recalls. “If you’d asked me what was going on, I would probably say we were thinking about the nursery being done, how things would change with a little boy at home. But then life changed that night when my son was born, and I struggled with it for quite a while – maybe for several years. It’s deeply important for us as parents, as individuals, in your family and at your work, to see things through others’ eyes. His rise to the upper echelons of technology and leadership has been influenced by his parents. His father is a civil servant who trained as a Marxist economist, while his mother is a Sanskrit scholar. Despite their divergent ideological stances, he acknowledges that his parents’ differences shaped him. The corporate world has often been chastised for its competitive nature, and incorporating this notion of compassion into this environment can be difficult. 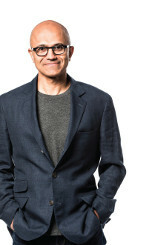 Drawing inspiration from his roots, Nadella has introduced books on non-violent communication to his leadership team in an attempt to change the company’s culture. The CEO recalls a time when he and his colleagues at Microsoft used to attend a class on ‘precision questions’. This method of communication, instigated by the softly spoken CEO, chimes with the culture Nadella has implemented at Microsoft; he is consistently attempting to grow in order to be the best leader he can be. The company is also attempting to evolve from its successful past and adapt to a new era of artificial intelligence and quantum computing. Nedella (centre) with Bill Gates (far left) and Steve Ballmer (far right). Nadella is pushing to be the best leader he can be, and has learned important lessons from his family, including the art of continuous learning and living in the moment.